Now, to be clear, "easy", I suppose, is relative. By easy, for instance, I mean yelling at all family members to Stay Out of the Kitchen because Mama is trying a new recipe. By easy, I mean Follow the Directions to a T.
But homemade marshmallows are something I've been dying to try for several years. My soul quaked within me. Would it be worth it? I asked myself. Haven't I heard horror stories about all kinds of candy making? I asked myself. Do I have a candy thermometer? I asked myself. The answer to that was NO. I decided to try anyway. Here are my reflections on what turned out to be an Epic Pinterest Win. First of all - It. Is. Worth It. I may never be able to stomach store marshmallows again, which explains something: I never cared for them that much in the first place. I only ever really enjoyed them when they were smashed in a S'more, burned beyond recognition. Now I realize my heart was just waiting for my one true love, which is, as it is so often, The Thing the Mediocre Thing Was Originally Based On. Second, I took to heart what my Mama always told me: if you can read, you can learn to do what you want. So I took a leap of faith and followed the recipe. So...Pinterest. Pinterest, Pinterest, Pinterest. How you've stolen our hearts and imaginations. 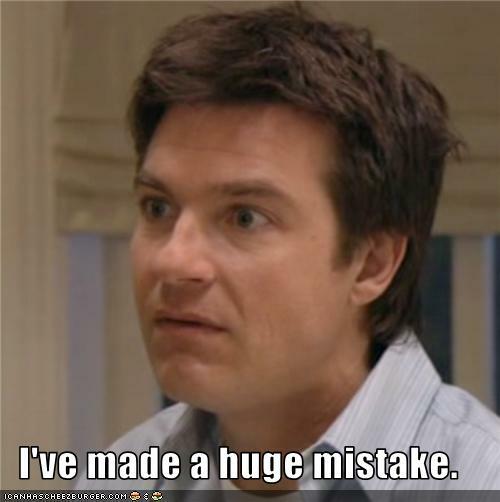 AS SOON as I started any instruction, I set the microwave timer. Here's the beautiful thing: you don't even need to stir. Leave it alone. Pour in. Heat. Lid on. Time. Lid off. Time. Pour into gelatin. Mixer on. Time. Add flavoring. Time. Pour into prepared pan. Look like freaking genius. A few notes: you must be quick. When the beeper goes off, move into action. This isn't the kind of thing where you can watch TV and come sauntering in after waiting for a commercial break. My Nutella didn't make gorgeous swirls because I didn't turn the mixer down, so it incorporated throughout. Still delicious, just less visually tempting. I decided I wanted to make a peppermint batch, so I checked a few recipes because I wanted to keep most of the one above. To make the one above into peppermint, I just omitted Nutella (duh), omitted the vanilla and added 1 tsp. of peppermint extract. After I poured it into the pan, I dropped red food coloring drops onto the top and (working quickly) swirled it with a butter knife. Another note: the pizza cutter is a great idea and the ideal tool. I think if I'd tried using a knife I would've ended up very frustrated. 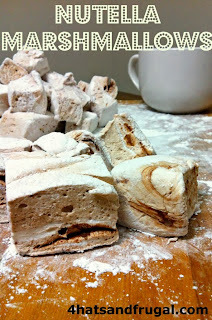 Until you toss the individual marshmallows in powdered sugar, they are sticky. So fear not, anxious cook: you too can make homemade marshmallows. After a ridiculous - I mean ridiculous - summer, I needed a mental break, an escape, a switch of gears. Which is why I was much more interested in last night's 2013 Emmy awards than I usually would be. Now, the last few years, I've enjoyed spring and fall fashion seasons more than I ever have: call it the Project Runway Effect, call it an enhanced appreciation of the art of textiles and how they are worn, call it having a rambunctious boy and needing to melt into something not related to trains, race cars or fire trucks. So when an award show red carpet opportunity rolls around, I play a little game and guess which of my favorite runway looks will end up on a celebrity. During Oscars season, I call this "Fantasy Red Carpet" (as opposed to Fantasy Football) and "dress" my friends in my favorite picks for them by choosing an ensemble, Facebooking my choice to them, and then waiting to see if any beloved gowns crop up at the Kodak Theater - well, whatever it's called these days (rest in peace, classic camera film: rest in peace.). After a ridiculous - I mean ridiculous - summer, last night I found myself gravitating to looks that were easy, fun, quirky, and didn't take themselves too seriously. After all, even if you like pulse-quickening dramas, the essence of TV entertainment is, well, entertainment; and entertainment, at its best, knows when to laugh at itself. To me, the Emmy's shouldn't attempt an Oscar level of gravitas (and often, I think the Oscar's shouldn't attempt an Oscar level of gravitas - as 30 Rock slyly hints through the fictional movie Hard to Watch). Many of my favorite shows come from the BBC, so with only Downton Abbey representing our cousins across the pond, I really didn't have much interest in who won which category (though I did have to cheer for unassuming fellow Michigan native Jeff Daniels). Let's look, then, at my favorite looks from the evening. Why? Because I get to, it's my blog. Nanny-nanny-boo-boo. And after all, when my sweet husband has been sick since July, and my Grandma fell and broke her leg and is in a nursing home hundreds of miles away, and I mysteriously broke out in hives for a few days, all while having a three-year-old and nine-month-old - well, let's just look at pretty dresses, shall we? A surprise upset from unexpected Red Carpet presence Ireland Baldwin, who came as her dad Alec's guest. Baldwin's gown neatly sidestepped that conundrum and added silvery fringe on top that nodded to the recent "Roaring Twenties" phenomenon, giving the look movement and fun. The modern hair saved it from being too literal an homage. Alongside the pale blushes were high-necked black gowns that created The Miss Haversham dilemma: how to wear this trend without conjuring a weeping Victorian spinster. Though I like Amanda Peet and remember enjoying this gown on the runway, I was surprised to find how dreary it translated - to me, anyway - at the Emmy's: no cheeky fun here. But fear not: Amy Poehler's version of the high-necked black gown was modern and whimsical (are those dragons on the hips? ), with coral accents lightening the otherwise Goth-prone option. The Color Purple: a tricky option for any woman, since purple can be so very warm or cool, so dated or modern. While Carrie Underwood, Alyson Hannigan and even fashion maven Heidi Klum attempted it, the first two seemed a bit "bridal party/prom" and the last felt Vegas (Tim Gunn described Klum's gown as "pomegranate," but I'm including it in the purple/berry neighborhood of the color wheel all the same). My favorite plummy look of the night came from comedienne Mindy Kaling: a modern, curve-flattering fit with embellishments that frame her face and just the right "Old Hollywood" hair to celebrate a glam occasion. Speaking of embellishments, where is the line between bold or brash, fascinating or fussy? Here's my take on a few eye-catching looks. I can't help it: I like this. It's a breath of fresh air, it's fun, and Anna Faris has a green lizard brooch on the back not seen here. I pick up notes of classic "Old Hollywood" alongside a bit of rockabilly. She looks like she's here to enjoy a party, and that makes the rest of us want to have a bit of fun, too. Verdict: deliciously free of feeling stuffy. I love sisters Emily and Zooey Deschanel: from "Bones" to "New Girl", the talented actresses portray characters I relish. I'm a fan of Zooey's Hello Giggles website collaboration and I enjoy that she sports quirky manicures at Red Carpet events. This particular event, however, both sisters chose ensembles that felt - to me - not youthful; in fact, the dreaded phrase "mother of the bride" sprang unbidden to mind, which I found distressing since I genuinely enjoy their fashion choices the majority of the time. Instead, I found myself favoring the bold, unfussy blue that Tina Fey sported - and, in her case, it did feel like sport. It looked easy (though I'm sure the Spanx did not feel so); she looked at home in her own skin, relaxed. In a different shade of bold, Jennifer Westfeldt wore one of my favorite looks of the night: the material, cut and design felt vintage, but the color breathed deeply of vibrant life. Many women could not carry it off; she did, with zest. Bold colors aside, some prints, embellishments, tattoos and "bling" accompanied some decidedly "love it or hate it" looks. In this area, much depends on personal taste. I think some of the risks worked, some didn't and some, for better or for worse, I'll never forget. I'm very biased toward Connie Britton's gown: it found its way onto my Pinterest Red Carpet board several months back. While I think that a gown this embellished would be best served with an up-do rather than draping curls - and while I think this gown would be best served with alabaster skin rather than a bronzed tan - those are styling quibbles: I'll always love this dress. "Portlandia" star Carrie Brownstein struck a whimsical chord with her striped dress; and if the heavily embroidered teal gown above was a touch too "Dowager" for the Emmy's, the one-shouldered look with two different patterns somehow evoked an almost Chaplin-esque nod - maybe due to its ability to evoke menswear, as if it took inspiration from a bow-tie or cravat. I think its understated charm may get overlooked as reviews roll in. "Downton Abbey"'s Michelle Dockery kept her look effortless, and I enjoy her Prada color blocking, the barely hi-low skirt, and the rather French-looking (why am I thinking French? I don't know) exuberance of bow that ties the halter. It has the sensibility of so many Marion Cotillard Red Carpet looks, which always seem as if she drifted in from a Parisian wander. What to do with Melissa Leo? The unconventional ensemble garnered a smile from me, as the actress seemed to channel Johnny Depp's taste. Glamorous? Perhaps not. But it entertained me, and she looks like she's having fun - which makes any outfit seem clever, whether you personally would wear it or not. 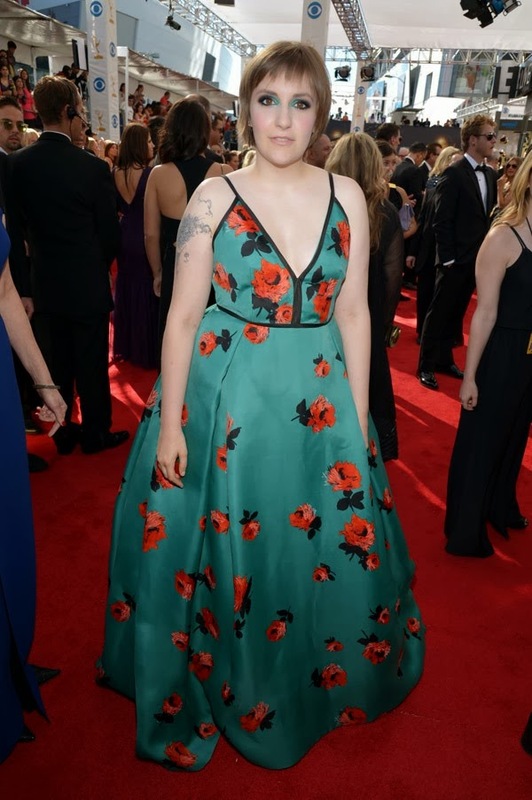 Which brings us to Lena Dunham. The writer and director may not be everyone's cup of tea, and her Emmy look certainly wasn't, as reviews are proving today. But there's something about it that appeals to me: namely, that I get the feeling that she wore what she liked and what she wanted to, and really didn't care if anyone else liked it or not. And that spirit is something I appreciate. 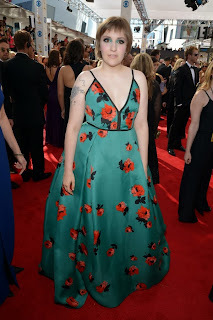 Incidentally, I do enjoy the gown, even if it is accessorized with a lot of ink and a rather shaggy pixie cut. It's possible she'll regret her choice in a few years, though I rather think not, from the sense I get from her interviews. I'll conclude with Morena Baccarin, who is eliciting a stand-up-and-slowly-applaud response from me...the "Homeland" actress is lo, with child, and took to the Red Carpet with a gorgeous red gown. When I was that pregnant...well, let's just say that she looked radiant, and I hope she's able to sit with her feet up today. Brava, Morena! So thanks to www.nydailynews.com and www.hollywoodlife.com for these photos. And thanks, all you ladies, for representing the rest of us, who stayed at home in old workout pants with our hair in a quick ponytail-bun. Even if I take just a hue or a hairstyle inspiration from you (and your hard-working stylists, I know), you make us all feel that a little bit of glamour is accessible. At its best, the beauty of fashion brings out, not the worst in women, but the best. The Next Doctor: Laurence Fox? From time to time, I must indulge in full-fledged geekery: the suave (ouch! ran into the door), elegant (oops! sorry, didn't see you there) woman you see before you has a very strong Inner Nerd - as my sonic screwdriver key chain attests. episodes of the new run will always be the David Tennant Doctor, engineered by brilliant Russell T. Davies, I finally made some peace with Matt Smith's incarnation; his acting went a long ways in redeeming the uneven writing by Stephen Moffat. But now - now, as the 50th anniversary special approaches and fans are promised the tantalizing prospect of John Hurt guesting as a formerly-unknown-to-the-audience regeneration of our favorite Time Lord, we know that Matt Smith is bowing out of this role and that the new doctor will be introduced in the Christmas special, much like David Tennant was after Christopher Eccleston's departure. However, I'm not just a fan of British sci-fi - I also love Masterpiece: Mystery! on PBS, and in particular I enjoy Inspector Lewis, with mouthwatering shots of Oxford and beautifully rendered storylines that weave otherwise mundane crimesolving with questions of art, beauty, science, truth, and faith. BUT WAIT! I was startled to discover the abrupt conclusion to Inspector Lewis, characters' lives resolved or transitioned to new vistas. There was some strange, vague statement about the actor who plays DS James Hathaway going off to America to study. I thought that odd...odd, as in, "it's quiet...too quiet." And any young-ish British actor with dramatic acting chops automatically enters the mix when you begin to consider Possible New Doctors. So I looked up Laurence Fox on IMDB (where else?) and received THE SHOCK OF MY LIFE, because I don't live in the UK and therefore I'm not up on their local actor gossip. But does the bride look...familiar? 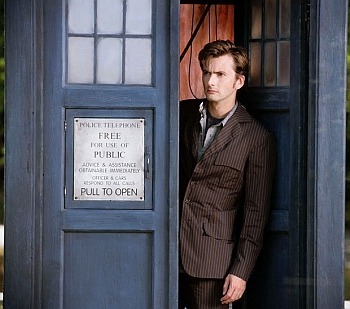 He's married to Billie Piper. David Tennant was at their wedding. And the David Tennant recruitment happened under the Russell T. Davies era, when Davies had recently worked on another project with Tennant. In other words, the role was kept, to a certain degree, "in the family." So maybe I'm wrong (though there's a great comedic line after one regeneration - "oh, still not ginger!" 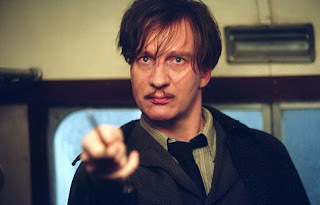 that could be resolved with a Fox Doctor), maybe they'll want to go for someone a bit older, a bit more battle-scarred and less "dashing young hero": my brother suggested someone like David Thewlis, who brought Professor R.J. Lupin to life in the Harry Potter movies. And that'd be fine by me. Maybe I'm waaaay off. And it's fun to speculate, and what's a fan to do during the off-season, but relish the opportunity to speculate, a "sci-fi fantasy football" of sorts? So this is my bet, my gamble, my wager: I'm putting it out there. 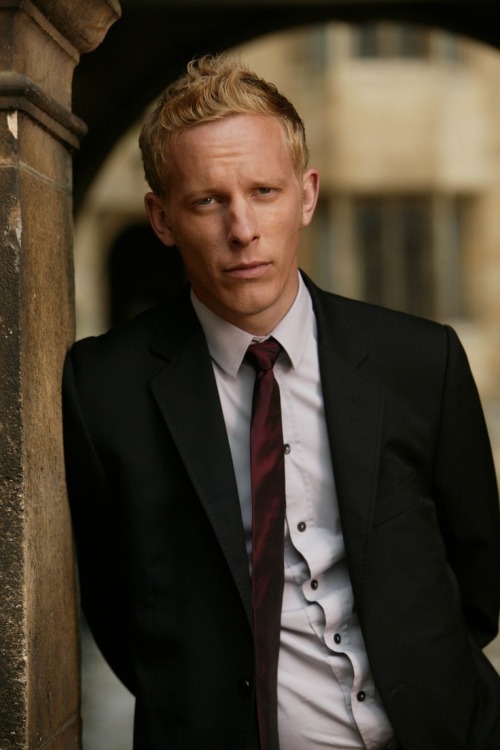 My money is on Laurence Fox to be The Next Doctor. And if I'm right, we're in for a treat, even if I do have to endure some of Moffat's more eyeroll-inducing plots. So? Who would you cast? It may seem bizarre that a young country with a freshly minted Bill of Rights might engage in this practice, but it’s not new on the global scene. What, then, feels bizarre? That there is bipartisan opposition and bipartisan support for the broad surveillance. There are Democrats and Republicans who support the notion of surveillance to keep citizens safe at any cost. There are Democrats and Republicans who oppose the notion of surveillance to provide safety at any cost. And so this OpEd by Maureen Dowd (ranked #43 on The Daily Telegraph's 2010 list of the 100 most influential liberals in America) sits comfortably alongside this OpEd on www.redstate.com – Red State, as in conservative. Who, exactly, are our bedfellows? Senator, for our founding fathers, safety was not the primary good; freedom was. Under your reasoning, British leaders should have kept Londoners safe by compromising with the Nazis rather than submit Londoners to the daily, lethal dangers of the Blitz. I will take the dangers of the Blitz any day over the threat of a totalitarian government. 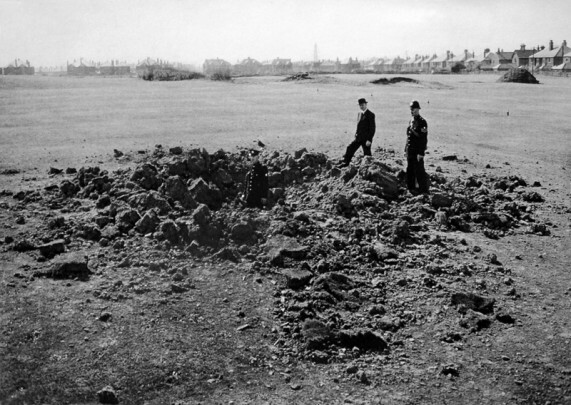 We will take their bomb craters and make sand traps on golf courses out of them. We will take our molten steel beams and create something new out of them. 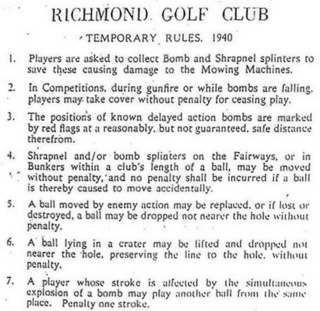 “Came across some local rules that were implemented by my club during the war. Bearing in mind we are within a few miles of Croydon, Kenley and Biggin Hill (wartime fighter bases). Some are obvious and a few remind us of the "we carry on regardless" attitude of the people at that time. to save these causing damage to the mowing machines. 2 In competitions during gunfire or while bombs are falling players may take cover without penalty for ceasing play (I like the word "may" in that one). 3 The positions of known delayed action bombs are marked by red flags at a reasonable, but not guaranteed safe distance therefrom. 4 Shrapnel and or bomb splinters on the fairway or in bunkers within a clubs length of the ball may be moved without penalty and no penalty is incurred it the ball is moved accidentally whilst doing so. 5 A ball moved by, lost or destroyed by enemy action may be replaced with a drop not nearer the hole without penalty. 6 A ball lying in a bomb crater may be lifted and dropped not nearer the hole, preserving the line to the hole. Without penalty. 7 A player whose stroke is affected by simultaneous explosion of a bomb may play another ball from the same place with a penalty of one stroke (A bit harsh that one if you ask me). In other words, safety is not the highest good; as J.K. Rowling remarks through the words of Dumbledore, there are things worse than death. But our problem is not only a problem of privacy; it is a problem of how to grapple with the problem of evil and death. “When we have overcome absence with phone calls, winglessness with airplanes, summer heat with air-conditioning—when we have overcome all these and much more besides, then there will abide two things with which we must cope: the evil in our hearts and death.” Nicholas Wolterstorff wrote those words in his poignant tribute Lament for a Son. On the battlefields of Europe—and not just Europe— those two things converge. Only when we cope with “the evil in our hearts and death” can we embrace freedom. We must learn to cope with death again. After all – there are worse things.